Knee-deep flood did not stop the installation of the new shepherd of the Diocese of Bayombong in Nueva Vizcaya province. Bishop Jose Elmer Mangalinao was formally installed as the third head of the diocese during a solemn ceremony in the Saint Dominic Cathedral in Bayombong City on July 25. Mangalinao replaced retired Bishop Ramon Villena who retired in 2016 after serving the diocese for 30 years. Present at the ceremony were a number of bishops led by Papal nuncio Archbishop Gabriele Caccia, who served as the installing prelate, the religious, and government officials. In his homily, Archbishop Socrates Villegas of Lingayen-Dagupan reminded Mangalinao to love his priests for they are the “reflection” among the faithful and the whole diocese. “The holiness of the priests will reflect on the holiness of the Catholic faithful, and if there’s corruption among the faithful, it will only be a reflection of the corruption of the presbyterium, [and] if there’s holiness in the parish, it can only be a reflection of the sanctity of the parish priests,” Villegas said. “Your priests are your face, your hands, and your voice. [I]f you want to love God, love your priests because your priests were configured to the image of God himself. [L]et the holiness of every priests be reflected on the sanctity of every Catholic faithful in this diocese,” he said. 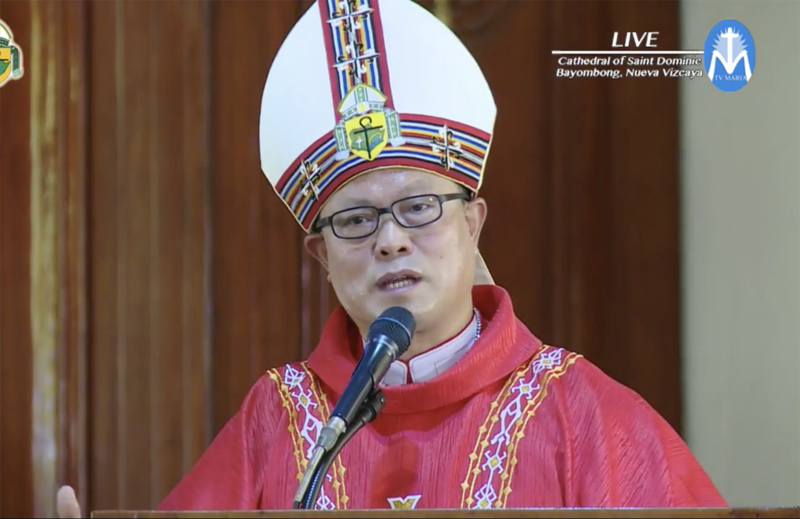 The archbishop also said Mangalinao even rode a garbage truck from Dagupan to Bayombong in order to be present at the scheduled time of his installation. “Take care of this which is the treasure of God that has gone to you but is not your property, it’s the property of God,” Caccia said. “If we want to help him, let us start today and say, “Lord, help me become a better person.” In that way, he will find his task more easy and more joyful,” he added. In his message, Mangalinao sought prayers from the faithful as he takes on his new task. “When you are thankful, you say it but when you are grateful, you do it. You respond to love with love. You respond to everything that God gives you with wholehearted mind and soul,” he said. “Without His holiness, which is also a gift and a responsibility, there is no way we will be able to reflect this goodness. I pray once again for the courage to embrace God’s gift of holiness and the responsibility,” he added. Pope Francis on May 24 appointed Mangalinao as the new bishop of Bayombong, a 36-year-old diocese with more than half a million Catholics in 20 parishes. Upon his appointment, Mangalinao has been serving as auxiliary bishop of Lingayen-Dagupan since 2016. Mangalinao was ordained priest of Cabanatuan on Oct. 15, 1985 and was ordained bishop on Aug. 22, 2016.